Summary: Learn how to build a greenhouse, prepare the ground, erect a greenhouse structure and glaze a greenhouse. A greenhouse should be located in an area of the garden that receives the most sunlight in winter. 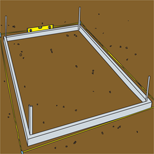 The ground on which the greenhouse is going to stand must be firm, level and free from vegetation. When choosing your greenhouse, consider the type of foundation it will need, as you may have to lay concrete to create a firm base. 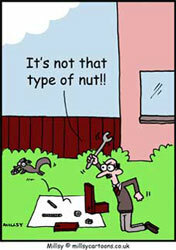 If this is the case refer to the project on laying concrete outdoors. Alternatively, you can buy a greenhouse kit that has its own base, which we look at here. Mark out the position of the greenhouse with a string line. Use a builder's square to ensure the corners are right angles (90°). Dig holes in the corners of the area for the anchors that will secure the greenhouse in position. Bolt the base sections together and lay it in position. 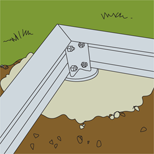 Use a spirit level and builder's square to check that the base is level and square. Fix the anchors to the base frame with the screws provided. Mix up some concrete. Use a fairly dry mix made up of I part cement, 2 parts sand and 4 parts coarse aggregate. Fill the holes with concrete and sink the anchors into the concrete pushing the base until it is level with the ground. Check that the base is still level and square. Lay the base section in position ensuring that it is level and square. Sink the anchors into the concrete until the base is level with the ground and make sure it remains level and square. When building the greenhouse structure do not over-tighten the bolts. At this stage you just need to tighten them to hold the sections together. Lay the sections that make up the ends of the greenhouse on the ground and bolt them together. Then lay out the pieces that make up the sides of the greenhouse and bolt them together. With someone helping you, lift the back section of the greenhouse and a side section onto the frame. Ensuring the corner is square bolt the two sections together. With your helper keeping the simple structure upright and on the base, bolt the other side section and the front section of the greenhouse to the first two sections. The two end and two side sections can now be bolted to the base. Fasten the roof's central ridge bar in position. Fix the roof bars between the ridge bar and sides of the greenhouse. Assemble the door and put it to one side. 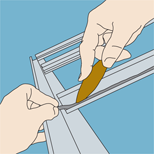 Using the W-shaped glazing clips supplied, fix the roof panes in position first. Then fix the glazing to the sides, front and back of the greenhouse. Hang the door on its hinges making sure it opens and closes smoothly. Then fit the glass panes in the door. Finally, move around the greenhouse tightening all the bolts. 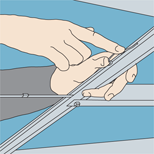 Slip rubber glazing strips into the glazing bar channels to protect the glass or plastic panes.